This has been an expectedly crazy week, and I think it’s the shortest, yet longest, week ever. – This weekend, even though it maybe raining, I get to see some of my favorite people, Meredith and Karen. We’re running the Back on my Feet 5 mile here in Philly. 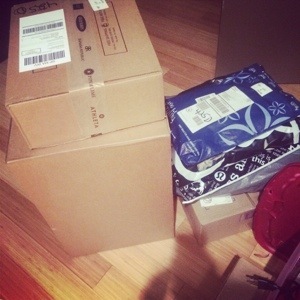 – I came home to this yesterday. – I have a big decision (well, kind of decisions) to make and its potentially life changing. I need to spend some serious introspective time this weekend and determine the right decision. – Continue to stay strong. I’ve been making good progress by staying committed to eating healthy and sticking to my training. – Sleep! I’m making some progress (small, but it’s a start) with shutting down and I’m getting a little more sleep each night. 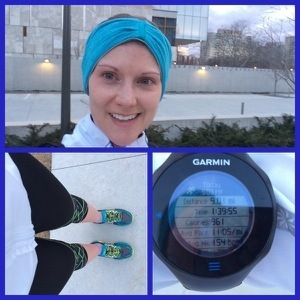 – I ran my fastest 9 mile long run this weekend. It was tough mentally for me, but I was able to use some sadness to push myself. – I’m learning how to deal with difficult training. I’m finding the value in learning that making it happen, even if you have to back off and push 50 or 75% instead of 110% it will drive improvement. Mentally and physically. – My decisions are due to some big wins professionally. I’m beyond honored to have these decisons, but I might go crazy in the next few days. Way to go girl! Good luck at your 5-miler and I’ll pray for your decision! Sometimes we have the best runs fuelled on emotions. I hope the run helped you. For me this week it has been about recovery, so just taking it easy and relaxing. Excited for the opportunities for you! No doubt you will do what is best for you. Enjoy the race this weekend! I’m hoping to get back on track and start consistently working out again. I’ve been on a one way trip to junk food, lazy town this week!